Max Kepler has endured a 2018 season that has seen significant highs, as well as some very real lows. Over the course of the year though, it might be easiest to describe some of the tribulations as simple bad luck. 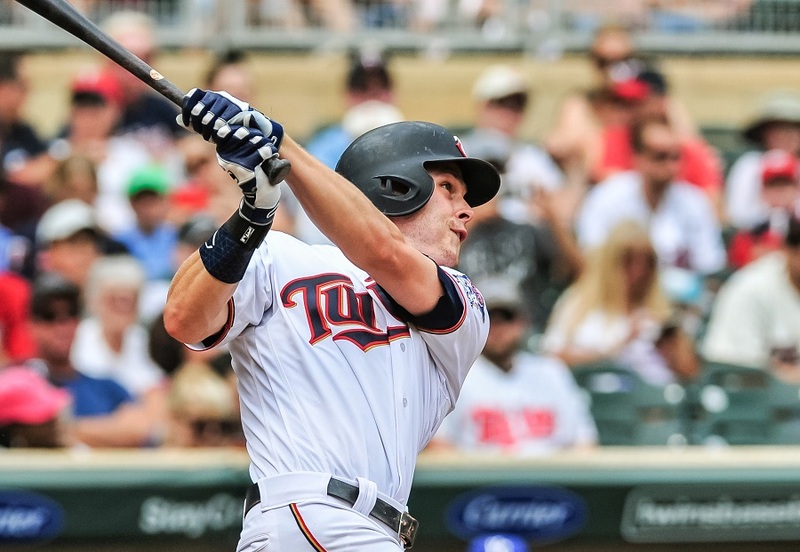 While the Minnesota Twins (as well as Max himself) would like to see better production as a whole, the numbers underneath the hood tell us that a new reality probably isn’t that far off. On the season Kepler’s .234/.326/.420 slash line doesn’t do much to excite baseball fans. His .746 OPS is a career high, and that number alone helps to further downplay the importance of a career worst .234 batting average. Looking back at his exploits for Minnesota this season, we can see that the total production is bolstered by a strong start and the current run, while being significantly dragged down by an abysmal month of June. The German-born lefty is mashing left-handed pitching this year, despite having taken a step back against righties. For a guy who was often benched down the stretch a season ago, it’s good to see those days are behind him. Now, when trying to quantify the potential impact of his bat, it’s easiest to look at what else is going on here. Kepler is setting career highs in some very significant categories this season. He’s walking more, striking out less, showing better plate discipline, making strong contact, and getting lift under the baseball. As you can see in the image, there’re some real avenues for growth on the surface thanks to the process currently being employed. Recently Tom Froemming pointed out how tough the game of baseball can be. Despite very similar inputs, Max Kepler’s results couldn’t be further off from Red Sox outfielder Andrew Benintendi. Just missing out on his first All-Star Game, Benintendi owns a .305/.388/.512 slash line on the season. Max is making better contact more often than Andrew but seeing significantly lesser results. To this point, it’s worth noting baseball is not a game with a one size fits all approach. There’s no denying the launch angle revolution has merit at this point. Simply put, the vast majority of players will have a greater success rate by lifting the baseball in the air. We know that “hard hit” contact is defined by balls put in play with at least a 90mph exit velocity. When it comes to launch angles, line drives are generated from trajectories of 10-25 degrees, while fly balls are produced by trajectories from 25-50 degrees. Marrying a strong exit velocity with an optimal launch somewhere between 25-30 degrees is going to create homers at a rapid pace. Dipping that launch down to something like 18-23 degrees should produce solid line drive rates. Looking at the hard-hit rate leader boards Kepler finds himself sitting 55th among qualified hitters. Three spots up from him at 52nd is the Astros Alex Bregman. In 2018 Bregman owns a .900 OPS thanks to a .277/.381/.519 slash line. His 22 home runs are a career high, and he was named an All-Star for the first time this summer. Bregman owns a virtually identical GB/FB rate as Kepler (0.81 to 0.84), and their batted ball profiles are eerily similar. What helps to distance the Houston infielder is the added lift he gets on the baseball. With an average launch angle of 16.3 degrees (and 28.8 degrees on home runs) Alex is getting enough of a process boost to significantly impact his results. When taking everything into consideration, it’s fair to believe there’s more to squeeze out of Kepler. The .251 BABIP is unsustainably low given the quality of inputs. Thankfully the normalization that takes place over the course of a full season should help to correct that average. It’s also relatively easy to see the surface numbers Kepler has provided us and compare them with more analytical factors to decipher a potential for growth. As Max continues to deviate from the ground ball plan of attack he has previously sided with there should only be added levels of success to follow. It’s entirely possible that we don’t see the full transformation of statistical output from Kepler in 2018. Given his current process there’s little reason to believe that an .800+ OPS isn’t more reflective of the true production level. The .860 OPS posted since the end of July (.264/.369/.491) seems much more indicative of what is truly taking place this season. 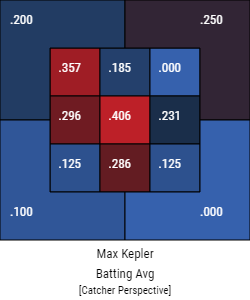 I’m not necessarily convinced that Kepler is capable of a 3-4-5 line but reaching an upper .800’s OPS or touching .900 is hardly out of the question. He’s still just 25 years old and clearly making tweaks to both his swing and approach at the dish. Knowing what we do right now about Kepler, it’s hard to believe there won’t be a season in the not-so-distant future that seems to come out of nowhere. If he were to post an .850 OPS over the entirety of 2019 it would be a 100-point jump on this season, and even more so on his career average. That would be a massive improvement but seeing it as out of nowhere would only suggest that the process hadn’t really been researched. 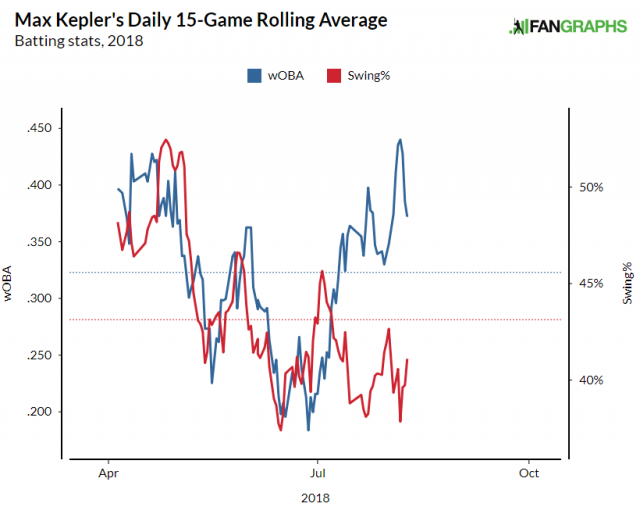 In a game that’s decided by so many little factors, Kepler is dealing with a decent bit of bad luck as he continues to make small tweaks that set himself up for future success. When those roads all intersect at the optimum level Minnesota would be welcoming another star into their stable of outfielders. Great article. May it rain four-leaf clovers on Max next season. If there is such thing as a luck account, might as well credit the rest of the season. Go big on debits next season. Thanks, Ted, for confirming what I thought I had been seeing all year. Not so sure.Good to see the analysis and the hope, but I was really expecting so much more this season. The problem is that with almost 1500 MLB PAs, Kepler has a career BABIP of .264. He's never hit very many line drives, which produce by far the highest likelihood of a hit. Benintendi and Bregman, by contrast, hit a ton of line drives. Average launch angle doesn't really capture this issue because flyballs and groundballs average out on paper, masking Kepler's poor distribution of batted balls. Kepler's batted ball profile has been very consistent over his career, which worries me because it indicates that bad luck is not a significant driver of his mediocre results. He will have to hit the ball harder or hit more line drives to produce beyond his current level with any consistency. Good article, especially noting the "unfairness" of some of the stats and results that Kepler has this season. I'm basing my opinion on only a handful of clips of Kepler I've seen in the past month, but his approach at the plate looks better/smoother (more fluid? ), and that all-important self-confidence seems to be kicking in as well. Hope he continues to make progress. We need him in that outfield. You make an excellent point and the numbers show it. Kepler's been at a 16-17 LD%, while Bregman and Benintendi are 22-23%. Kepler did have a 22-23% rate in his monster A+/AA season of 2015.Yes, it's an outlier, but he was pretty young and likely physically immature player in the seasons prior to that. He's made the adjustment against LHP at the big league level, so I'm hopeful that he can adjust again to drive the ball more. He's been slower to develop at the big league level, but we have been able to see a player that is maturing year over year. I wouldn't bet on him getting to perennial outputs of Bregman and Benintendi, but if it happened, I wouldn't be that surprised either. I've been very pleased with kepler's continued good defensive play, but I'm concerned about the hitting. there's some positives in the peripherals, but also some things that make you wonder if there's going to be much more advancement. drivelikejehu makes a good point: it's harder to blame this season's low BA on luck when kepler has never had a BABIB over .276 in his MLB career. What if last season was the aberration and we should expect something around .265? He might actually only be a little unlucky this year (.252) not significantly so. I don't think the jury is in yet on Max; the fact that he's not getting crushed by LHPs this season is a good sign...but it's a pretty SSS. (I'm not ready to say he's figured it out based on 130 PAs) His struggles against RHP is a bit weird, after 2 seasons where he raked against them, so maybe the bad luck is concentrated there? not ready to give up on Max, but overall this feels like a disappointing season so far. maybe he'll finish strong? I'm rooting for him, to be sure. 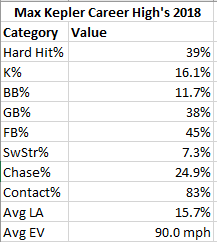 I'm also skeptical of the 'bad luck' theory in the case of Kepler.The data that drivelikejehu and JLease cite is just as real (and relevant) as the data called out in the article.Additionally, Max's hard-hit balls are distributed very predictably on the pull side.He's easy to defend. Having said that, he's improved on some aspects, and shows every sign of being the type of player that will continue to put in the work to continue to improve.That simple fact along with him still only in his age 25 season suggests that there will be plenty value there before it's all said and done. I won't get into the statistical debate because it looks to me like the article and previous posters have done a GREAT job pointing out the reasons to be optimistic and the reasons it might not work. Seriously, great job Tom and others. This kind of stuff is why I come here. Bottom line to me is that if this team/lineup is going to work to contend in 2019 the 2-3-4-5 hitters need to be Rosario, Polanco, Sano and Kepler, although I might switch Rosario and Polanco (its that old school best hitter hits 3rd thing). Mauer or Forsythe can hit first, with the other 6th, Garver and the DH 7 and 8 and the CF 9. If no Mauer, Forsythe leads offand if we get Escobar, he hits 5 and everyone moves down one. Kepler is a huge key to making that work. He needs to get his average up to the .260s, OPS in the .775-.825 range, and hit 20+ HRS. The talent says that all of this is possible and possible soon, the results to date give one pause. He is key to 2019 success. Probably should have included a link to Parker's article and thread where all of this is hashed out. It's a good point and counter point. All lift is not created equal. 100 mph two hoppers are outs as often as hits. If anything he has developed slightly better plate discipline that is been shown by the slight increase in isoD, as expected by a player getting closer to his prime. I will not even pretend to be able to break down all the analytics presented. Nor will I pretend to know exactly what adjustment Kepler still has to make. But I will speak about the eye test. He has a tremendous swing. And when he makes solid contact, out or not, he hits absolute laser beams. He also seems to have a good eye and doesn't chase much, and makes decent contact. I've always thought Max was a year behind his fellow age players due to his play in Germany vs a top HS program in the states. And he practically skipped AAA. Question: couldn't some of his numbers reflect hitting RHP so well until this season, and performing so poorly against LHP until this year skew his numbers somewhat? If he can maintain, somewhat at least, his improvement against LHP, and revert back to his previous performance against RHP, I believe we could see a big upward trend in 2019, possibly beginning here the second half of 2018. Talent and potential don't always win out, but he seems so natural with everything he does that I believe he is about ready to "break out". When I watch Kepler, the problem I see is he gets eaten up by FB's up and in, regularly. That's death in the big leagues. He may be our CFer of the future, in which case his production doesn't look so bad relative to his position.But his defense also takes a hit. I've talked about this ad nauseam but that's pretty much the difference in swings like Kepler's versus someone who is a barrel-turner. Check out Rosario's ability to cover fastballs up versus Kepler's. Rosario's process is to turn the barrel whereas Kepler's is more of a standard hands-to-ball-barrel-comes-with approach this allows him to get to fastballs up. The other thing that stands out about Kepler that I haven't heard anyone talk about is how much Kepler's head moves from the delivery to the point of contact. Kepler starts tall and then crumples his head down, changing planes. Rosario, for all his movement, keeps his head on the same level. 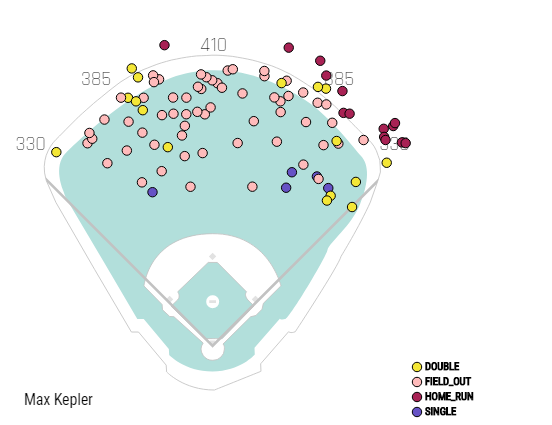 To Kepler's credit, he's still stinging the ball and making a very high amount of contact per swing. I just wonder if the movement might also have some impact on his contact point. According to StatCast, Kepler has one of the highest amounts of balls put in play on fastballs that were hit "poorly/under" the ball. These are balls that are hit at a launch angle that result in very few hits (sky balls, long flies and infield flies). I don't know how much this actually means to a player's skills as just above Kepler in the second highest spot is Cleveland's Jose Ramirez, who is having a very fine year. Last year's king of poorly/under hit balls was Francisco Lindor. This year Kepler has 66 of those types of batted balls and he currently has that amount this year. There might be hitters who barrel up balls more often and then just miss to result in the poorly/under ball while other hitters might barrel fewer pitches and actually skew towards the poorly/under hit ball for better results. For instance, while Lindor led baseball in poorly/under hit fastballs in 2017, he still managed to barrel 24 fastballs total (20th best in MLB). Kepler, on the other hand, barreled just 8 fastballs in 2017 (222nd). This year he's barred 10 fastballs (147th) whereas the guy ahead of him in the poorly/under hit chart this year -- Jose Ramirez -- has barreled 27 fastballs (7th best). There's so much left to learn/understand about the StatCast data and how it applies to real life baseball but there's a hugely untapped market there. 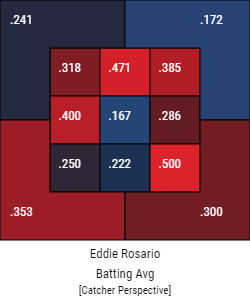 The balls Rosario hits worst are the ones right down the middle? That's our Eddie! Yeah, I see Kepler make contact up and in, but it’s all bat handle, or late. Or both. 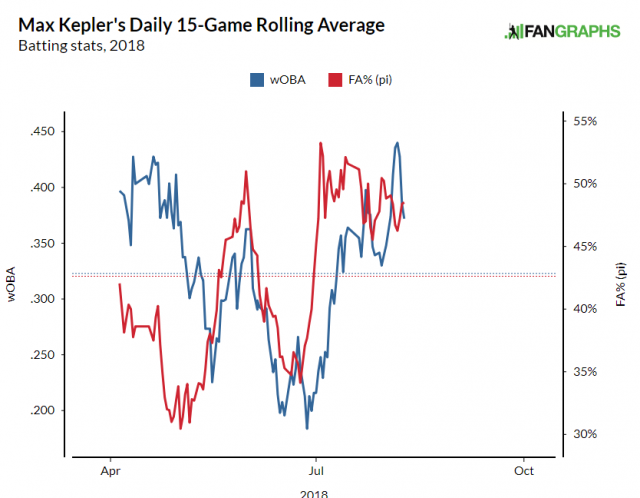 This article was written in the middle of the last/most recent road trip.On that road trip, Kepler posted a BABiP of .056 (1 for 18).If Max were to get 6 hits on his next 6 balls-in-play, he'd still be below (for the recent stretch) the 'normal' that is being suggested here as Kepler's inevitable destiny. OK...1 for 18 is bad luck.But, the idea that all batters will tend toward a .300 BABiP is a false narrative.Max's batter ball profile will need to change to get to the optimistic end of our hopes. 1) Max Kepler hasn't been bad. 2) All 3 of Kepler's seasons in the majors are of similar caliber, he has been the same player for 3 years. I don't think Kepler is going to get much better, except possibly on defense. But he's also not bad, so big deal. The Twins are paying him the minimum they can and he has been worth $10M - $15M a year. Where's the problem? Should this thread have really been titled "Will Max Kepler ever be an All-Star?" Probably not. So what? He is a contributor. He's at the same level as Greg Gagne (87), Randy Bush (87), Roy Smalley (87), Gene Larkin (87, 91).... All solid contributors to world series winning teams. Kepler's expected wOBA is .332, which is a career high for him but not notably above league average of .328. Agree that you can win championships with solidly/consistently average players...even at several positions.Also, I do think Max can be better than solidly average...but how much better is what is at the heart of this article. One of the central themes of the article (and an article that proceeded it) is that Max has been 'unlucky' with regard to batted-ball results.And that we could expect better results in the future based both on real (for lack of a better term) improvements he is making...but also based on his batted ball luck normalizing.I'm disagreeing with the later, is all.At 1500 career plate appearances, his BABiP has already 'normalized'...and it's a low number. And that we could expect better results in the future based both on real (for lack of a better term) improvements he is making...but also based on his batted ball luck normalizing.I'm disagreeing with the later, is all.At 1500 career plate appearances, his BABiP has already 'normalized'...and it's a low number. Bingo, there's bad luck and sure, Max has had some but at that many PA's, it's eventually just that's the hitter you are. FWIW, Gagne was a 3.9 bWAR player in 1987. He averaged 3.2 bWAR and 470 PA per year from 1987-1991. Kepler is currently averaging about 2 bWAR per 470 PA.
Bush, Smalley, and Larkin were not everyday players those seasons either.